Munoz: Borders pose no limits. The 3 Mexican retail groups that Nissan brought to the U.S. Grupo Autocom: Acquired 5 stores around San Francisco. Began as a Datsun dealer in Mexico in 1966 and now owns 17 stores in that country. Last year, it retailed 15,000 new cars there. Grupo Autofin Mexico: Has 3 dealerships in Orange County, south of Los Angeles, operating under the Imperio name. Nissan says the brand has not performed well there in the past. The large Mexico City retailer had 2014 sales of $1.4 billion. Soni Group: Acquired 2 stores in the Houston market and is seeking others there. The group is another Mexico City high-flier for Nissan. Soni sold 35,000 new cars last year in Mexico. What Nissan gets from its Mexican dealers in the U.S. A track record: Last year, Nissan's retailers in Mexico delivered a 26.2% market share. That is tantalizing to an automaker that wants just 10% of the U.S. market. Loyalty: Nissan has enabled its Mexican dealers to thrive. Many are heavily focused on the Nissan brand and seek opportunities to grow with it. Hispanic demographic marketing: The Mexican companies bring Spanish-language and cultural understanding to U.S. markets with fast-growing Hispanic populations. Nissan is pulling out a secret weapon as it pushes for more market share in the U.S.: Mexican car dealers. Not U.S. car dealers of Mexican or Hispanic ancestry - but retailers from Mexico, who Nissan believes can electrify certain markets across the United States. Nissan is helping to usher a number of Mexican retail groups into dealerships in California, Texas and possibly Florida and Illinois as part of CEO Carlos Ghosn's drive to increase U.S. market share. "They are big dealer groups who have been very successful with Nissan, and they want to continue to grow with us," says Jose Munoz, Nissan's hard-charging chairman for North America. "To me, it's very good. We are leaders in Mexico, and I don't see us being limited by borders." Munoz, in his former job as head of Nissan Mexico, helped push the brand and its local retailers to their current No. 1 market position. It is a two-pronged strategy for Nissan. First, it wants to tap into a group of high-performing and fast-growing Mexican retail groups that last year delivered to Nissan an enviable 26.2 percent share of the Mexican auto market. Second, Nissan believes the timing could not be better to introduce Spanish-speaking sales organizations to select markets as Hispanic demographics explode across the U.S.
"We have a strategy to reach consumers of all kinds, but the Hispanic consumer is a key focus for us," Munoz says. "Nissan is well-known in Mexico. And if those customers come to the United States, I believe they will buy Nissan vehicles here, too." The three key geographic areas for investment by the Mexican retailers so far have been suburban San Francisco, the Orange County region south of Los Angeles, and Houston. Munoz characterizes those large markets as areas where "Nissan's performance was not so favorable, but we've seen interest from Nissan Mexico's auto groups in entering the market." The automaker has eased the entry of Grupo Autofin Mexico of Mexico City into the broad Orange County area between Los Angeles and San Diego. The group, which had $1.4 billion in 2014 sales from 60 dealerships, now owns Imperio Nissan of San Juan Capistrano, Imperio Nissan of Garden Grove and Imperio Nissan of Irvine. Meanwhile, Grupo Autocom, a retailer from the Central and Southwest Mexico states of Guanajuato and Michoacan, last year acquired four Nissan brand stores and one Infiniti store in metro San Francisco. "We have our eyes open for some others," says company President Manuel Garrido. "But we want to concentrate our resources in one market. That is the model that has worked well in Mexico." Garrido says his California stores expect to retail 4,000 new vehicles this year. That would be more than double what the stores achieved before Autocom acquired them. "In the last couple of years," he says, "it has become clear that this is an excellent moment to invest in the U.S. market. We see a restructuring taking place here, and we see Nissan having a very bright future here." Last year, Autocom sold about 15,000 new vehicles through 17 stores in Mexico - 14 Nissan, one Infiniti and two Renault stores. Separately, Garrido says, Autocom sold about 30,000 vehicles through a fleet-sales company last year, operates its own auto finance company and owns an independent technology company, Go Virtual, that markets Mexican aftermarket parts, dealership tech services and advertising services to other retailers around Mexico. 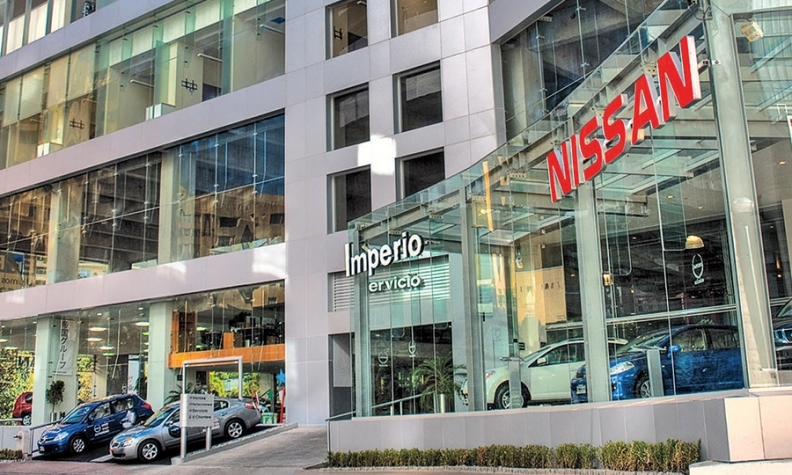 Grupo Autofin Mexico's Imperio Santa Fe store sells Nissan vehicles in Mexico City. While the family-owned Autocom may look like a Johnny-come-lately to U.S. retailing, it is anything but in Mexico. Garrido's 78-year-old father, who is still active in the company, started as one of Nissan's original Datsun dealers in Mexico in 1966. And what used to be a tradition in U.S. auto retailing - focusing exclusively on one manufacturer - remains common today in Mexico. Garrido's group is focused on the Renault-Nissan Alliance family of vehicle brands. That strategy is paying off in Mexico. Autocom is outpacing industry growth there. Last year, its volume grew 16 percent, compared with a 6.8 percent increase in overall Mexican auto sales and a 10 percent uptick for the Nissan brand itself. Now, Garrido wants to seize the same opportunity with Nissan in the U.S.
"We're proud to maintain our loyalty to the Nissan group," he says. "It's been very successful for us. And we believe we have the opportunity to grow with them in the United States." Nissan also has helped introduce its Mexican network to the Houston market. Mexico City's Automotores Soni S.A. de C.V. has acquired two Houston-area dealerships - Central Houston Nissan and Baytown Nissan. "We would like to acquire two or three more Nissan dealers in this market," says Fernando Somoza, a longtime Texas auto retailer who now is executive dealer for Soni Group's Houston market. "I've already approached some other dealers. "Of course, you can't make anyone sell who doesn't want to. But Soni is a very wealthy corporation that really believes Nissan has growth potential in the United States, and we want to participate in it. We're willing to pay multiples of four and five times value." Last year, Soni retailed about 35,000 vehicles in and around Mexico City. In addition to selling autos, the company is one of Mexico's largest financial lenders, according to the Asociacion Mexicana de Distribuidores de Automotores, the country's franchised auto dealer association. Retail groups from Nissan Mexico also have tried to acquire dealerships in Florida and around Chicago, according to Nissan dealers in other markets. In a couple of acquisitions in both California and Texas, the factory enabled the Mexican groups to enter the market by exercising its contractual right of first refusal clause, interrupting planned sales to other U.S. dealers to give the Mexican groups a chance to buy the stores. But Jeff Rosen, chairman of Nissan's National Dealer Advisory Board and principal at Rosen Nissan in Milwaukee, says there has been no noticeable dealer outcry. "I think we all agree that we want Nissan to succeed in the market and we all want to sell more Nissans," Rosen says. "Our dealers have visited some of the Mexican dealerships, and what they're doing down there is very impressive. I think they will help us do what we're trying to do here." With more than 17,000 U.S. dealerships fighting for pieces of the U.S. car and truck market, many of them deeply entrenched, well-financed and highly adept at surviving business challenges such as the 2008-09 recession, there would seem to be little opportunity for foreign retailers here. Nissan Motor Corp. of Japan is hungry for more U.S. market share, and Munoz - a former nuclear engineer from Spain who joined the auto industry through Toyota of Europe - is charged with making it happen. Munoz's boss, Ghosn, has set the clock to achieve a 10 percent U.S. market share by March 31, 2017. The Nissan brand's share is now 7.7 percent. Munoz believes Nissan's Mexican retailers are going to help him get there. Five years ago, Ghosn dispatched Munoz from Europe to step in as president of Nissan Mexico. Munoz discovered a rare opportunity: In Mexico, auto dealers face yearly contract renewals. Munoz used that lever to sort out dealers who were zealous to grow with Nissan from dealers who were complacent or underperforming. The results were dynamic. On the network side, the dealers regrouped and consolidated themselves into large clusters: A single dealer might now possess an entire small or midsize market, and a large metro market such as Monterrey or Mexico City might be divided among just two or three dealers. On the business side, the results were even greater. The Nissan brand's share of Mexico's auto market grew to 24.86 percent by the end of 2012 from 20.7 percent in 2009. Two years ago, it continued up to 24.87 percent. Last year closed with a 26.2 percent market share for Nissan. "We can't do in the United States what they were able to do in Mexico," Somoza points out. "But we can create more clusters here. If we can consolidate more, Nissan can really step ahead." 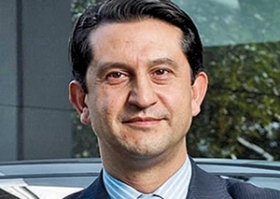 Somoza says that his Central Houston Nissan is tracking to sell 3,000 new vehicles for the 12-month period ending with Nissan's fiscal year, March 31. But that's not the target, he says. "We want to be selling 8,000 to 12,000 a year in Houston," he says. "And you get there by building yourself into a cluster of stores." Two decades ago, this concept was referred to as a "market area approach" and was pursued by only one automaker: General Motors' tradition-challenging Saturn brand. Somoza was a Saturn dealer in those days. "It was an idea that worked very well," he says, chuckling at the notion that, five years after the demise of Saturn, the approach would return to the U.S. retail landscape via Mexico. But why is it necessary to have Mexican auto groups pull off such a transformation? "Because they have the money, and they have the willingness to do it," he says. "And also because for many of them, they have the allegiance to Nissan to do it." They also have the language skills. Sara Hasson, senior vice president for automotive in the Strategy & Insights group of the Spanish-language media and marketing company Univision, says Nissan is moving ahead of the competition in reaching out to Spanish-speaking U.S. consumers. "Nissan is on fire with Hispanics, and Nissan realizes the tremendous relationship it has with the Hispanic community," Hasson says. "Nissan has already overtaken Honda as the No. 2 import brand among Hispanics. We estimate that 32 percent of Nissan's year-over-year growth last year came from Hispanics. "The strategy that Jose Munoz is implementing with Mexican dealers is going to change things in California." 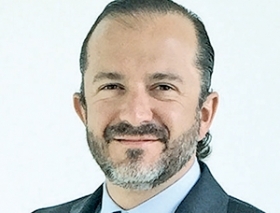 Airton Cousseau, managing director of Nissan in Mexico, puts it more bluntly: "There are 30 million Mexicans and Hispanic people in the U.S. now," he tells Automotive News. "We need somebody who speaks their language and understands how they are buying. So we are bringing the best dealers we have in from Mexico." Autocom's Garrido maintains a cautious tone, acknowledging that his company and other Mexican retailers have much to learn about selling cars in the U.S. And he acknowledges that some U.S. auto dealers already are doing an excellent job of appealing to Hispanic consumers. "We have to tackle this opportunity with care," Garrido says. "We don't want to portray ourselves as only a Mexico company for all the other people of the area. The San Francisco Bay Area is a very diverse community. "But when we speak to the Mexican and Hispanic market, we're going to have some advantage compared to U.S. dealers." Even that requires some finesse, he admits. "I must confess that we are also learning about the culture of Mexicans who live in the U.S.," Garrido says. "In many cases, we're talking to people who are in their second or third generation here." These consumers have "have great pride in being Mexican," he says, but also value their U.S. heritage. "When they know we come from Mexico, they like it. But they also want us to understand their current reality."